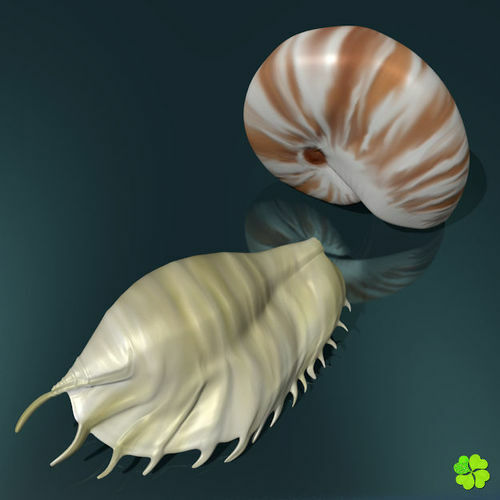 Realistic models of a nautilus shell and another lambis truncata. Size in centimeters (nautilus shell): 24.67 (X axis), 11.95 (Y axis), 19.76 (Z axis). Size in centimeters (lambis truncata): 30.00 (X axis), 16.38 (Y axis), 9.80 (Z axis). Two object with a mesh manifold each. 100% quads (9,072 quads total). 9,076 vertices and 18,144 edges. No faces distorted more than 45 degrees. Six textures of 4096x4096 px. Optional textures available in additional file (for fbx and obj files). Render with the Blender internal engine without post production. The images of the mesh in orthographic view. The FBX and OBJ files are exported from Blender 2.78 (-Z Forward, Y Up) and may need some adjustment (textures).